Congress is currently considering the fate of many critical programs for low-income Americans in the year-end fiscal showdown, widely known as the “fiscal cliff.” As lawmakers debate the future of these programs, the U.S. Census Bureau today released important new data on poverty and hardship that should inform Congress’s decisions about a balanced approach to deficit reduction and tax reform. 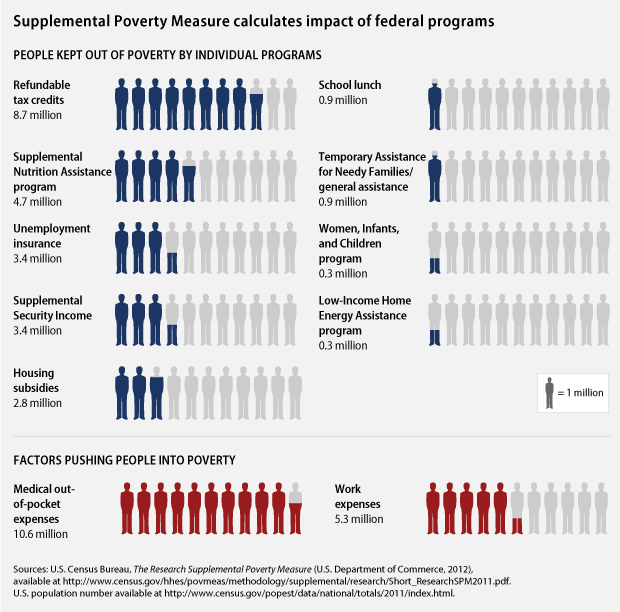 The 2011 Supplemental Poverty Measure data offer a more comprehensive picture of poverty by taking into account factors such as work expenses and medical costs that push families into poverty. They also provide crucial information on the effectiveness of work and income supports in lifting families above the poverty line. At a time when programs providing opportunity to low-income Americans—such as those supporting affordable housing, tax credits for working families, the Supplemental Nutrition Assistance Program, and child care assistance—are potentially on the chopping block, the data provide important insights on policies providing pathways into the middle class, which is America’s engine of economic growth. The Supplemental Poverty Measure data show that 49.7 million people, or 16.1 percent of Americans, lived in poverty in 2011. This is a statistically insignificant change from the rate of 16 percent in 2010. Despite the grim news on poverty, though, some good news can be found in the data. One of the key things the Supplemental Poverty Measure data tell us is that public policy does make a difference in lifting people out of poverty and alleviating economic hardship. Refundable tax credits for working families such as the earned income and child tax credits, for example, lifted 8.7 million people out of poverty in 2011, and the child poverty rate would have been 6.3 percentage points higher without them. Similarly, the Supplemental Nutrition Assistance Program lifted 4.7 million people out of poverty in 2011. Without it, the child poverty rate would have been 2.9 percentage points higher. At the end of 2012, though, the expansions to the earned income and child tax credits for working families—which kept hundreds of thousands of children out of poverty in 2010 and lessened hardship for millions more—are set to expire. The Senate already passed a bill that would continue the expansions to these tax credits, as well as all the middle-class tax cuts, while allowing the tax cuts for the wealthiest 2 percent of Americans to expire. The House-passed bill, in contrast, would end the tax credit reforms that kept 1.6 million people out of poverty in 2010, while preserving tax cuts for the wealthiest 2 percent and the bonus estate tax cuts that only benefit the wealthiest 0.002 percent of estates—while adding billions of dollars to our deficit. Similarly, if Congress fails to act programs such as the low-income home energy assistance program will be hit at the end of the year by automatic across-the-board cuts that would eliminate 734,000 households from help paying their utility bills. This would occur despite the fact that the Supplemental Poverty Measure shows that this program lifted more than 300,000 people above the poverty line in 2011, mainly in households with seniors, children, and people with disabilities. The supplemental poverty data also show the types of expenses that, alternatively, are driving families into poverty. Medical bills and work-related expenses, for example, played a big role in increasing economic hardship for many Americans. Out-of-pocket medical expenses pushed 10.6 million people into poverty in 2011. In fact, the senior poverty rate would be nearly cut in half (8 percent as opposed to 15.1 percent) if not for these expenses, underscoring a need for Congress to avoid cuts to Medicaid and Medicare that would shift costs to seniors and low- and middle-income families. In too many cases, work-related expenses such as transportation and child care costs also undermined economic security for working families and children, with 5.2 million people pushed into poverty in 2011 due to costs related to their jobs. Yet if Congress fails to act, across-the-board cuts slated for January 2013 would kick 75,000 children off of Head Start services and end 25,000 child care slots that enable parents to work while children are in a safe and educational environment. These trends would only exacerbate the number of families in poverty and make it harder for a family to transition into the middle class. The Supplemental Poverty Measure shows that millions of people are still struggling—that they are either out of work or without sufficient income to meet their basic expenses without falling below the poverty line. But the data also underscore that millions of Americans are being lifted up by effective work and income supports that keep families afloat in tough times and provide a pathway to the middle class. These policies must remain in place if we are to continue moving our country in the right direction and offering opportunities for all Americans to thrive. By bringing people off the economic margins and investing in their participation in shared economic prosperity, we can significantly cut poverty and accelerate economic growth. We have the resources to accomplish this goal even as we tackle our long-term deficits. We just need to make the right policy choices. As policymakers consider deficit reduction, jobs, and tax plans over the coming weeks and months, it is important to understand how investments such as tax credits, nutrition assistance, housing, child care and early education, health, and transportation policies all affect the economic security of struggling families and their ability to meet other basic needs such as food and shelter. The supplemental measure data show that these policies work in keeping families out of poverty and giving low-income families and their children the opportunity to enter the middle class and pursue the American Dream. With the stakes so high in the pending fiscal showdown, this is news that policymakers need to hear—and to which they must adhere. Melissa Boteach is the Director of the Poverty and Prosperity program at the Center for American Progress. This material was originally published by the Center for American Progress. It is reprinted here with permission.